If you want to take respite from the baking heat then visit this winter garden. It was a pleasant surprise to come across this amazing winter garden and I was doubly wowed that it has street art in it. I’d gone there to see a Jean Dubuffet sculpture that sits in the grounds of the hospital. So I brazenly walked through the hospital reception area feeling a bit weird. I mean, I was there to see art, not exactly the first reason you think of for entering a hospital. Anyway, I walked through the lobby as though I knew which direction to find the Dubuffet, and voila I ended up spotting this wonderful winter garden instead. Needless to say I was both baffled and amazed, I felt like I’d found a secret place where street art collides with evergreen plants. What’s more, there are graffiti stencils by urban artist collective Mosko et associés. I recognised their work because at home there’s a Mosko hanging in our living room. Their signature subject matter is to make depictions of liberated zoo animals. At home it’s a Mosko tiger – roaaaarrr. 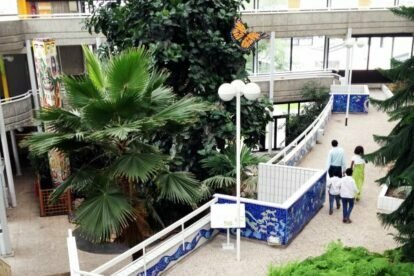 Here in the hospital’s winter garden there’s tigers, massive flying butterflies, and hidden crouching hippo’s. It’s a cute space, especially fantastic too, to see a father helping his son (on crutches) along a stroll through the foliage. Well done Paris, I thought, for having foresight to include art as part of the recuperation process. Three words I left with: futuristic, upbeat, beguiling.